Premlata Agrawal, the oldest woman in India to have climbed Mt. Everest, has conquered Mt. Vinson in Antarctica in pursuit of the 'Mountaineering Challenge' of climbing the 'Seven Summits'. 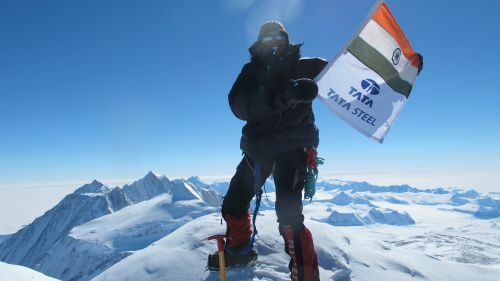 Sponsored by Tata Steel, Premlata completed her Mt. Vinson expedition on January 6. The person successful in conquering all the seven summits is considered a member of the 'Hall of Fame' for mountaineers. 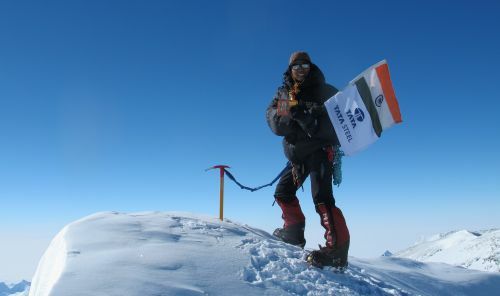 If the 49-year-old Premlata, a homemaker and mother of two grown up daughters, achieves the remarkable feat, which she is looking to accomplish in 2013, she will become the first Indian woman and one of the oldest in the world to conquer all seven summits. With the successful climb of Mt. Vinson, she has only one peak left -- Mt. Mckinley, which she narrowly missed last year because of rough weather. The other peaks she has scaled since taking to mountain climbing at the age of 35 are Mt. Everest, (29,035 ft.), Killimanjaro (19,334 ft.), Aconcagua (22,841 ft.), Mount Elbrus (18,442 ft) Europe, and Carstensz Pyramid (16,023 ft) Indonesia, Elbrus in Europe, Mt. Carstensz in Australia. Her achievements were recognised as a National record and found a place in the Limca Book of Records.